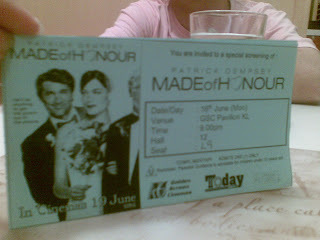 We saw the ad in an issue of Today Newspaper in Campus-- free movie passes to the premier night of Made of Honour, a new movie starring Mcdreamy himself. Reg and I made a pact-- we'd go to the event but we wouldnt do anything extraordinary like run, sing, scream, etc. We would maintain dignity and decorum at all costs. Most importantly, it was going to be a top secret mission that would stay one if we were not successful. It was one of those things that would be part the "things I to do before I die" like going to a fans day for a favorite artist (done that!) or riding a rollercoaster (hmmm..still thinking) or visit the eiffel tower (planning to..). Anyway, so off we went to Pavillion Mall in KL which is about 60 kms away from our campus. We got there about 630pm and by then the line was about a hundred meters long. It looked doable so we lined up. 45 minutes later we were armed with our first movie passes to a free premier night. We had an extra ticket so we did a good deed by passing it on to a group of locals who lacked one ticket. Throughout the line I was silently praying that no one I know (esp the students) would recognize me. hehehe. The movie was okay. A typical chick flick that would make the hopeless romantic say "sigh" an "aww." Mcdreamy delivered his dreaminess and the rest of the support cast were so funny. We had fun despite the fact that we were seated on third row with our heads almost in a horizontal position because the screen was right infront of us (but no complaints! after all libre ito!). My eyes hurt like hell afterwards and by the time we got home at 12mn, I was deadtired and my migraine was acting up. All for the chance of watching a movie for free.